The 2019 Mazda CX-5 is a sleek and popular crossover SUV. This worthy representative of the Mazda SUV line is packed with many internal and external technology features that can make it a pleasure to ride in. These features include a number of pushbutton control options as well as a healthy infotainment package. The 2019 Mazda CX-5 crossover provides drivers with effort enhancing tools such as pushbutton start. Now, drivers no longer have to search and fumble for keys in order to start their vehicles. This innovative SUV also includes other electronic goodies such as electronic parking brakes that take the effort out of the operation. The 2019 Mazda CX-5 also keeps drivers and passengers connected and entertained during their journeys. The CX-5 offers a full-featured infotainment system anchored by the MAZDA CONNECT service. This system makes it easy to enter commands with it's voice-activated system. Occupants can connect over Bluetooth, SMS, and much more. 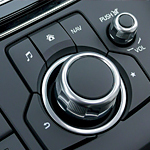 In addition, the CX-5 offers auxiliary tools such as USB power points and even audio headphone jacks.